SHAUN PAUL BARRETT was ratified as Donegal minor manager at county committee on Monday night and can continue to harness the talent that he helped develop. The Milford clubman, who is a Garda sergeant in Buncrana, has worked with development squads for nine years and oversaw the fortunes of Donegal’s underage footballers from Under-14 level to the (U-17) McGuigan Cup winning panel of 2014 following the (U-16) Buncrana Cup success a year beforehand. Last year, Declan Bonner took Donegal to a first ever All-Ireland minor final and was kept on this year as the Ulster Minor League was retained, only to see his team fall against Derry on a 0-11 to 0-10 scoreline in the Ulster semi-final in Clones. Bonner was this week named as the new county Under-21 manager and has players like Niall O’Donnell from St Eunan’s, Cloughaneely’s Jason McGee, Nathan Boyle of Aodh Ruadh and Naomh Conaill forward Eoghan McGettigan will be underage for the minors next year. Barrett’s backroom team will be made up of: Kilcar’s Neilly Byrne as selector; goalkeeping coach Darren Nash from Milford; St Eunan’s Under-21 manager Noel Keaveney as video analyst; Anthony Harkin from Ardara is in charge of logistics; kitman Paddy McGinty from Glenswilly; Luke Barrett, Shaun Paul’s son, from Milford, on stats and Conall McFadden, also from Milford, as physical therapist. “We’re very happy with the team we’ve put together,” Barrett continued. “I’ve worked alongside Neilly for a long time and he’s very experienced and very well got. He’s a good way with him and works well with young players, as he has showed at Carrick Vocational School. 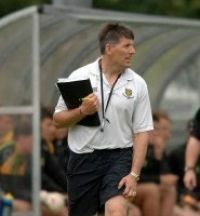 Anthony Harkin coached Donegal to the 1992 All-Ireland title. “They’re all good characters and that’s important,” Barrett said. In the meantime, Barrett will continue as manager of the Milford seniors, who face Aodh Ruadh on Friday evening in the quarter-final of the AllSports Donegal IFC in Convoy. The Moyle View Park outfit, whom Barrett won Under-14 and Under-16 Division One titles with, are also top of the All-County Football League Division Three. As well as the commitments with his local club, Barrett can now cast his eye on the County Minor finals, which take place on Saturday week, September 19. Kilcar face Milford in the Division Two decider before Naomh Conaill take on St Eunan’s in the Division One showpiece. The draw for the 2016 Ulster MFC will take place in mid-October and in such a minefield of a province, it’s likely to provide a stern test. Donegal will aim for a third successive Ulster Minor League from March on. “The Ulster championship is always competitive and our aim is to have the panel ready for it,” Barrett added.